The Sullivan Striders team members held up their banner and celebrated at the finish line in Dobbs Ferry on Saturday afternoon. 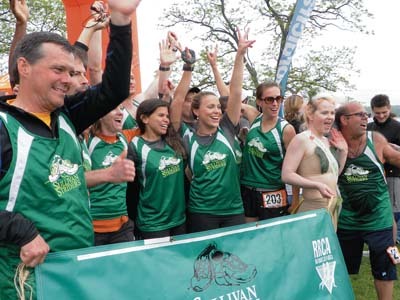 SULLIVAN COUNTY  Teams of runners from several states were in Sullivan County on Friday for the start of the Ragnar Relay. The 2011 Ragnar Relay New York event began on Friday at Bethel Woods Center for the Arts and ended on Saturday evening in Dobbs Ferry in Westchester County. Each team in the event had 14 members, two drivers for each van and six runners. The runners took turns running the 36 legs of the 196.3-mile course which went through Sullivan, Ulster, Orange, Rockland and Westchester Counties. The Sullivan Striders Running and Walking Club entered a team in the event. John Flynn was the driver for the the Striders’ Van No. 1, which included runners Abby Billias, Joe Falcone, Nancy Figueroa, Joanna Goldfarb, Kelsi Lockhart and Donald “Mac” Thurston. Harold Johnson was the driver for the Striders’ Van No. 2, which included runners Brian Burns, Kim Klemen, Kristen Matsen, Richard Robillard, Shona Sneddon and Dennis Toscano. Groups of runners left Bethel Woods every half hour on Friday, from 5 a.m. to 2 p.m. Each team’s second van of runners left the Catskill Mountain Adventure Resort near Summittville from 10 a.m. to 7 p.m. on Friday. At about 3:40 p.m. on Saturday, the Sullivan Striders team reached the finish line in Dobbs Ferry. As noted in the official Ragnar Relay RagMag, which every participant received during their team check-in and safety briefing, each of the 36 legs of the race was different based on the number of miles as well as the terrain the runners had to traverse. The shortest leg was 1.9 miles, while the longest leg was 9.9 miles. The Ragnar Rally New York is one of 14 different Ragnar Rally events being held this year throughout the United States. The Ragnar Relay benefits the American Cancer Society. For more information about the Ragnar Rally, visit www.ragnarrelay.com.